Meanwhile, back in Covington, Draud peppered Knochelmann with questions and his trademark folksy jabs. "Congratulations to the attorneys that agree with me," Draud said. "Maybe those attorneys should meet with Adam Edelen so they can explain to our state auditor what's constitutional and what's not constitutional." Draud called the recommendations "very troubling" and "very unfortunate" that Ohio would not be included. Though he maintains that under current law it is illegal for them to vote, Draud also supports putting Ohio votes on the board, he said. "I think it's kind of ironic when it was such a campaign issue and you promised it would be," Draud told Knochelmann. "You really have castrated Ohio's voice on CVG." As for Boone County's two votes, Draud also wanted tougher talks about sharing payroll tax derived from the airport. Though CVG is managed by Kenton County, it is located in Boone County. 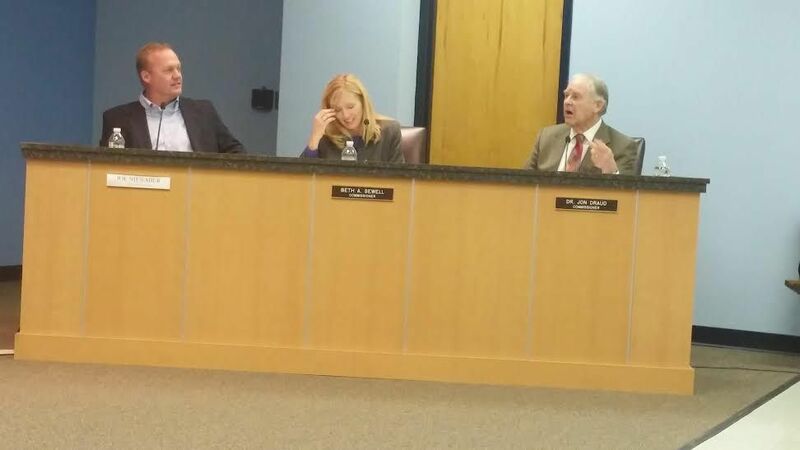 "It's a mistake to give Boone two votes instead of one vote without them sharing some of the payroll tax," Draud said. "While we're giving them something they should give us something." Draud suggested that the revenue from Boone could be put towards removing the 911 dispatch center fee for Kenton residents. Knochelmann said that he agrees on the payroll tax and Ohio resident issues, but the latter at least would require a change in the state constitution, he said. The former's legal issues have not been explored. "Let's focus on getting the structure fixed," Knochelmann said. Kenton Co. has dramatically benefited from the success of the airport. How many organizations are based just a stone's throw from Boone County and they are there because of the airport. I just think if we get into an aggressive attack on their income sources, we're probably going to get nothing more than a no. The key to it is, we benefit, they benefit, we want the continued success of the airport and make sure that the structure is set up for the next several decades." Draud said that there is nothing wrong with the current structure and that the previous issues related to spending and travel were "some individuals' bad judgment". Knochelmann argued that it was the fractured structure that led to the accountability issues that permitted the expenditures. Newly elected County Commissioner Joe Nienaber expressed that as more access is granted to surrounding counties in relation to the Airport Board, Kenton County should be making more of an effort to gain influence in regional entities like the Port Authority in Cincinnati. "This might be a first step for us in getting influence on other regional issues," he said, directly referencing the Brent Spence Bridge corridor project. Commissioner Beth Sewell said that regional cooperation on this issue could help with other issues down the road like the further consolidation of 911 emergency dispatch as more counties join a singular system. "This may bode well for us down the road with other regional efforts," she said. The resolution of support for the recommended changes passed 3-1 with Draud dissenting. "I hope we don't have this discussion for another eleven months," he said in voting no. "I've had all the discussion I want about the Airport Board."